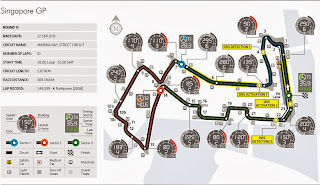 Formula 1 has descended into the Singapore night and teams are set for the best looking Grand Prix on the calendar. You can never tire of the reflection of the lights on the cars, or the sound of the V8's bouncing off the buildings. Pirelli have gone quite conservative here by bringing the Super-Soft and the Medium tires for this low grip and bumpy asphalt. With compounds being a shade softer this year, expect strategies and tyre wear to be similar to what we saw in 2012. Two stops should be the way to go. The organisers have paid heed to the drivers request for a change to the Singapore Sling, whose kerbs used to send drivers into orbit, or at least aerially into the barriers. The start stop, tight and twisty nature of this street track bears little resemblance to Monaco, except that the barriers are alarmingly close at some points. Due to the fact that this race came into being almost a decade into the 21st century, safety requirements give drivers more margin for error in the form of run off areas. Paramount importance is on traction out of slow corners around Marina Bay, mainly because there are just so many of them. Red Bull has the most efficient rear aero which channels the exhaust gases around the diffuser to provide maximum rear end grip and traction, and that coupled with Vettel's form around Singapore makes for a heavy mix. Mercedes should be back in with a fight after two disappointing runs at the low downforce circuits of Spa and Monza. They will see comfort in the fact that all the circuits left to run after this are medium to high downforce configurations. They seemed to face the same problems that Red Bull used to face earlier. The cars have so much grip that they lose out on the faster tracks. With very high levels of humidity, there is always a chance that it could rain, especially in a tropical place like Singapore. 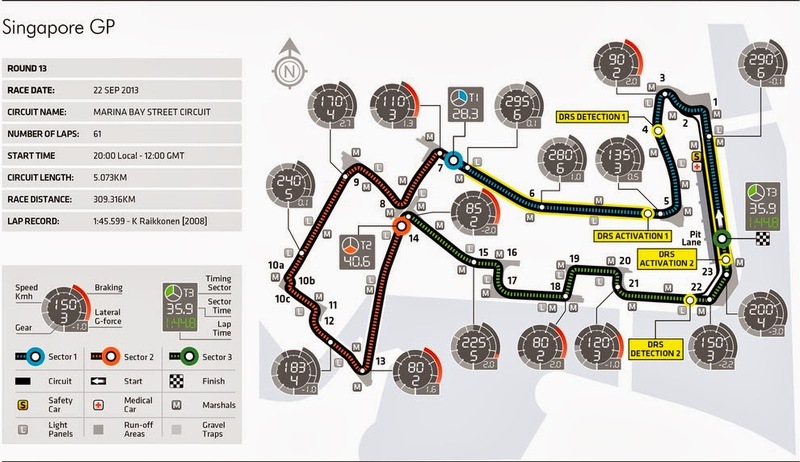 Given that we have not had a single wet race in SIngapore, the law of averages states that we are due for one. Ferrari seemed to have improved but their true form will only be visible come saturday. The last time out in a similar configurations at Hungary and Monaco, they couldn't really take the fight to the front runners. Development at Lotus seems to have come to a halt, but they should be more competitive here than they were at Spa and Monza.